I love the fall. Its my favorite time of year. I love the sweaters, the boots, the crisp air, the Halloween candy, and I really love all the new TV shows. Grey's Anatomy debuted its 8th season last night in typical dramatic form. A sink hole swallowed people alive and the good doctors of Seatlle Grace Hospital cared for the wounded. 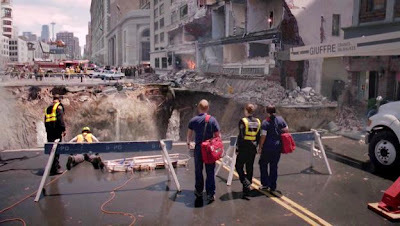 The episode featured a married couple who had fallen into the sinkhole. The wife's leg was pinned underneath a car, and in order to save his wife, the husband was forced to saw off the leg. The gory and unlikely scenrio prompted the following converstation. ME: Justin, say we were in a sinkhole and a car was pinning my leg - would you cut it off to save my life? JUSTIN: What in the world are you talking about? JUSTIN: Is that show still on? ME: YES! And its fantastic - so would you? Would you cut off my leg? JUSTIN: No. I would cut off your head to stop you from screaming. That is hysterical. I was wondering what would my husband do and I am about to ask him. I need to know this. Will report back with what he tells me.